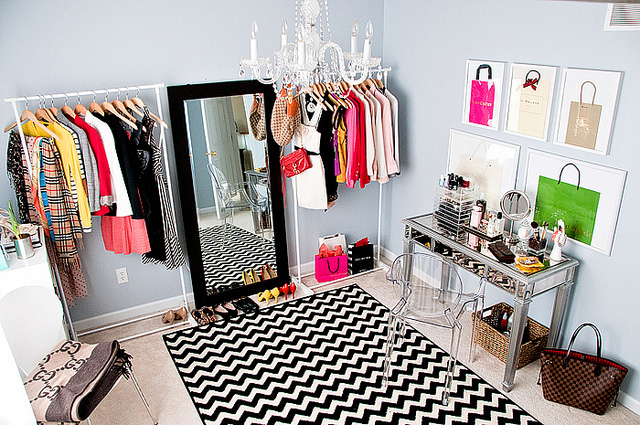 think about it: sometimes a wardrobe needs a whole room. but it can also double as a creative workspace. viola! the lovechild is born known as the cloffice. 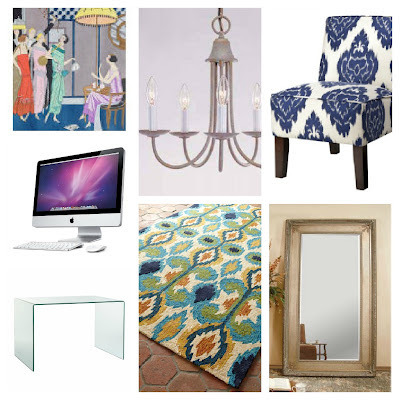 we will need: (1) imac computer + (1) glass desk + (1+) full-length mirror + (1) area rug + (1) upholstered chair + (1) chandelier + (1+) fashion wall art. that chandelier is under $75. i cannot wait for my next house to have a cloffice! stay tuned for my nursery/office combo. I really can't wait to do this! I have been pinning lots of "cloffice" inspirations lately :) I might even have one less child to accommodate the need for a room hahahaha. Just kidding- kind of.